Graybeard Outdoors > Rifle and Optics Forums > Skinner Sights Sponsored by Skinner Sights > ??? Thanks for the tip Singlebarrel. May have to try that, I sure miss hunting with my peeps! I order that tallest front sight from Skinner and use a Dremmal Tool or a small file to make the point. That way I have plenty of height to work with. Sometimes I file the point and have to re-do it because the sight is too high. It takes some trial and error, but it works. I also paint mine white or red to make it easy to see. I do not understand why more people that complain of blurred front sights do not use this. That fine point is clear and makes a wonderful aiming point for precision shooting at a reasonable distance. With peeps on a rifle, it is hard to get the middle section of my tri-focals lined up to see the front sight. Forget a cheek weld. Political Correctness is a doctrine, recently fostered by a delusional , illogical minority and promoted by a sick mainstream media, which holds forth the proposition that it is entirely possible to pick up a piece of cr*p by the clean end! if you need to use glasses with a peep, you need to alter the diameter of the aperture. properly sized, you don't need glasses. you may lose some light through the peep, but you will see the front sight AND the target. 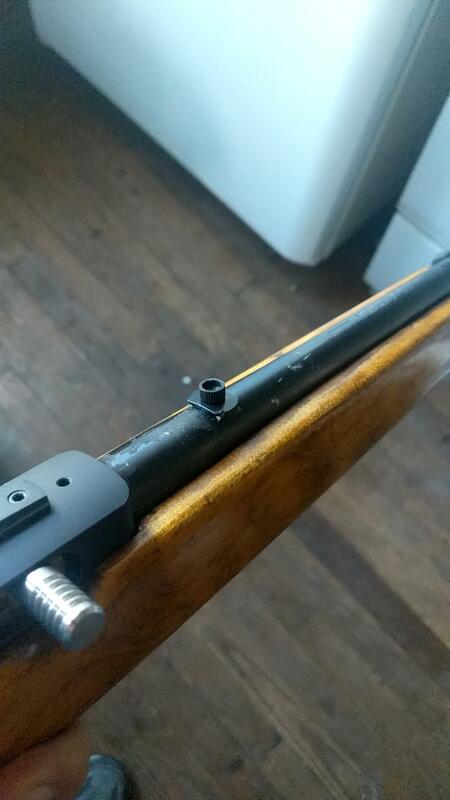 I'm going to swap my tapered A1 style front sight over to the square post . On my Tech-sights in the Ruger 10 22 with 22" barrel. That "pointy" sight is getting harder and harder to see. Rob at Skinner's is AWESOME. Skinner's express Sights for my 10/22 carbine. I used a Brownells receiver.and a factory stock 18.5 barrel. But Rob worked with me . Wound up with. .650 front sight. Bloody little thing is dead on now. Skinner's is aTop Notch outfit. The quality of there products is fantastic. Check out that dovetail filler with an extra aperture in it..